So, how could Moishe Dayan possibly plan to take the "Little Maginot Line" atop the Golan Heights in less than 24 hours without help from the Syrians? The conquest of the West Bank and the Golan Heights was never decided by the Israeli Government. This was the private venture of the then Defense Minister Moishe Dayan and a few generals who were very much interested in this adventure and the Israeli Government was really faced with a fait accompli. And so when the occupation was accomplished, nobody really knew what to do with these territories – nobody knew why they were occupied – and nobody knew what should be done with them. But it was clear from the very beginning that as far as the Palestinians were concerned, they thought this was an opportunity to bring an end to the conflict by Israel allowing them to establish their state – their own Palestinian state in the West Bank and Gaza Strip and in fact they proposed it in a very naïve, I would say, manner; they just came to the authorities and said, "OK, now that we are again face to face with the Jordanians out of the picture and the Egyptians out of the picture, let's solve the problem." This was an historical moment when we could say "OK, go ahead." But since it was a period of confusion and the government was unable to make up its mind, no decision was taken. And Golda Meir came into the office with a very clear idea that annexation of these territories was the preferred solution for Israel and if possible this is what Israel should be aiming at. From then on we are faced with a very clear policy which was common to all Israeli governments since then that if possible and to the extent that it is possible, these territories should be annexed and become part of Israel and that is why we are here now 20 years later with the problem unresolved. 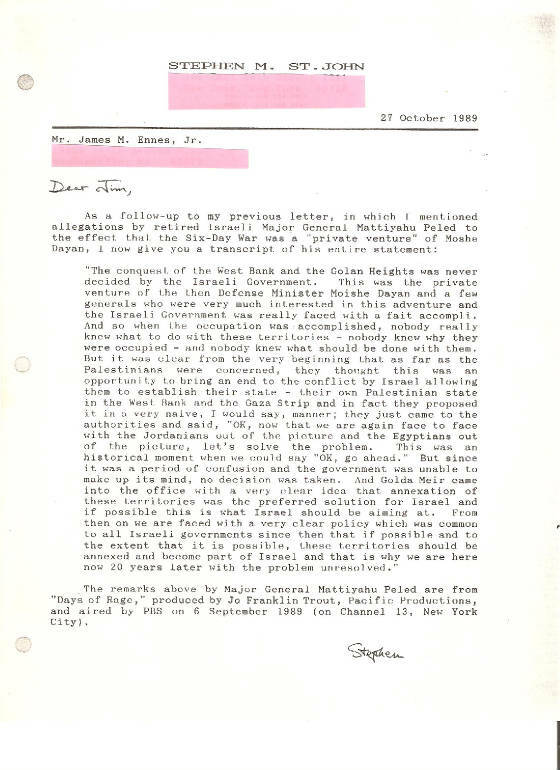 The remarks above by Major General Mattiyahu Peled are from "Days of Rage," produced by Jo Franklin Trout, Pacific Productions, and aired by PBS on 6 September 1989 (on Channel 13, New York City).